Action toys are all about inspiring kids to get active and carried away with imaginative play. This eclectic group of gifts will definitely move playtime beyond the television and offer an exciting alternative to the mainstream toys on the market. Let’s take a look. Who says action figures have to be made from plastic? Not us! And that goes double for robots! We say the best action figure-meets-robot toy you can give your kids is one that will fire their imaginations. And for sure that has to be Cubebots by Areaware. These are a delight of a toy, made from sturdy wood and poseable in dozens of different ways. If your kids are old enough to be swept up in the Minecraft craze, then they’ll definitely adore Cubebots. They come in sizes from mini to giant and in natural or a cheery selection of colours. 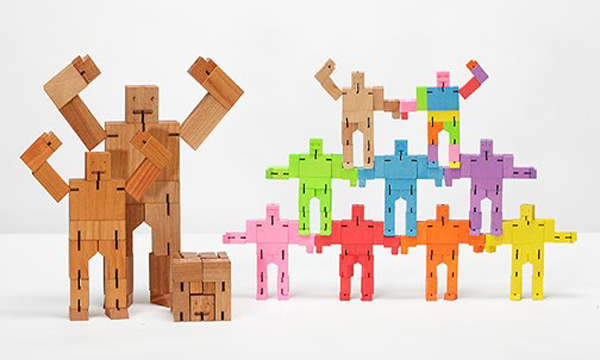 Find your favourite Cubebot at Kido Store, priced from $12.95. 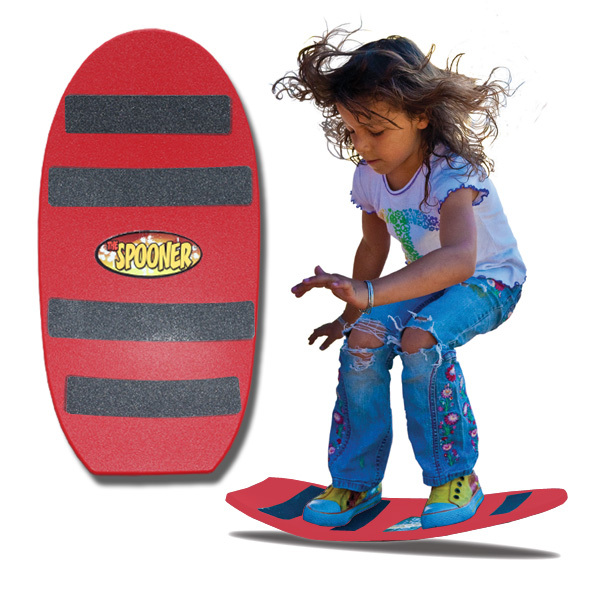 The Spooner Freestyle Board is the perfect introduction to skateboarding, snowboarding and surfing but is also great for free play. Appropriate for kids from two years up, this toy can be used to sit, rock, spin, tilt and wobble. It has a wide base so it is difficult to fall off and is rounded to allow for manoeuvrability and tricks. 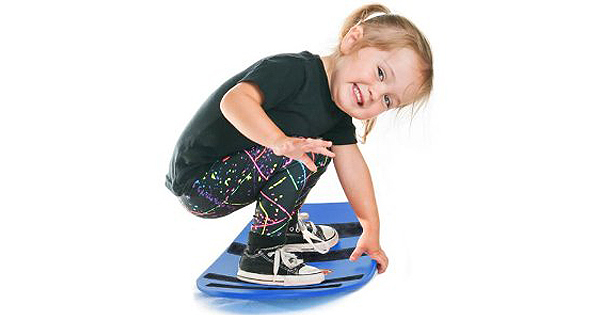 The Spooner Freestyle Board is great for developing core strength, gross motor skills, balance and coordination and is virtually indestructible. You can buy it for $74.99 from IQ Toys. A good old fashioned pillow fight happens pretty much every day at our place. Sometimes it’s just for fun and sometimes it’s because, try as you might, kids will get grouchy and fight. 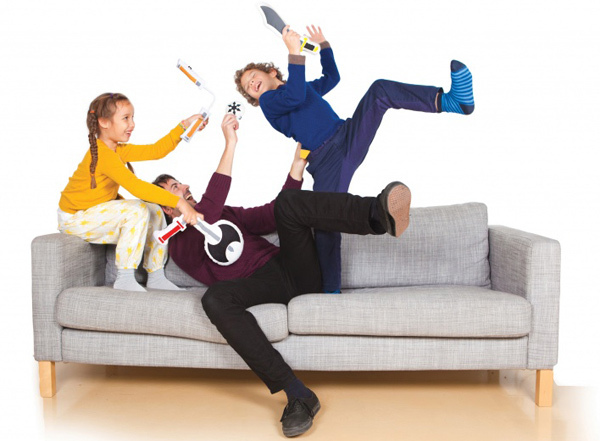 And while I’m certainly not one for arming my kids with weapon toys, I do quite like these quirky Pillow Fight cushions. There’s an axe, nunchakus, a ninja star and a sword. Use them for pillow fights or to fuel countless action hero games where no one’s in danger of getting poked in the eye with a plastic sword. They’re in stock at Lark and cost $49.95 for the set. Many dads only wish they had a tool bench this well stocked. 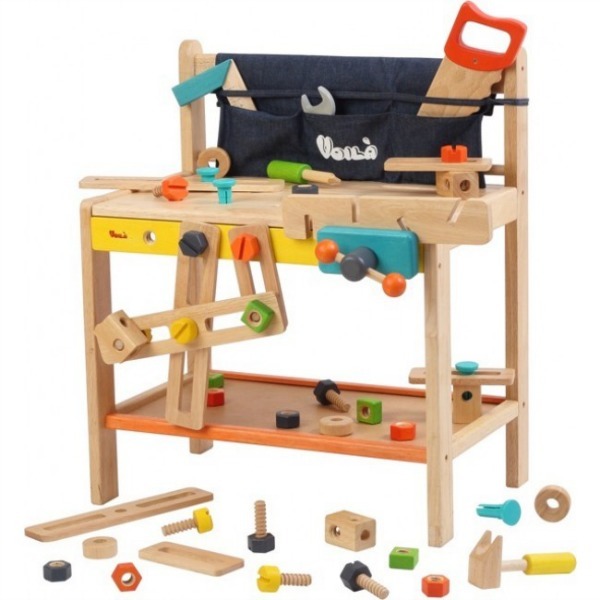 The Voila Workbench has everything a child could possibly need to screw, hammer, build, bolt and assemble a handmade masterpiece. Beautifully crafted from sustainable rubberwood and water based paints, the Voila Workbench is suitable for children from three years. Create some dad envy and buy it for a special little someone this Christmas. Eco Toys has it for $199.95. Budding scientists will love the 6-in-1 solar robot kit. For curious kids who are good with their hands, this is a great gift idea. 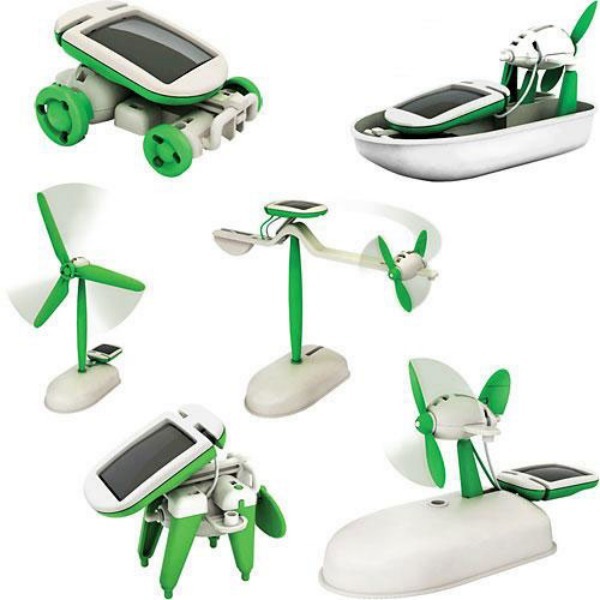 Consisting of 21 parts that can be assembled into six different solar powered toys and it doesn’t even require tools to be put together. Aimed at older children; the solar robot kit inspires them to create, educates them about solar energy and gives them a great sense of accomplishment. You can buy it for $34.95 from coolthings.com.au. A train set is a rite of passage and this particular version gets the mum tick-of-approval. 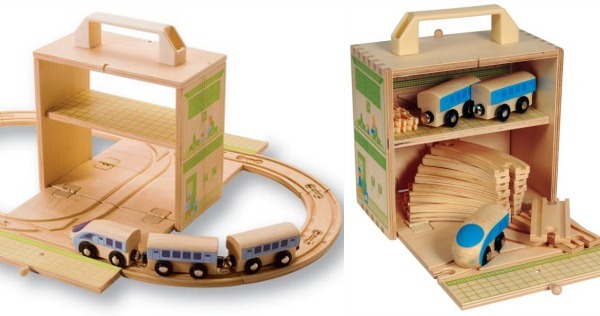 The Boxset train from TigerTribe comes neatly contained within a plywood box and comes with train tracks, a workshop, engine and two carriages (extension parts are available to purchase). I love how easy the Boxset Train is to deconstruct and put away when the kids are finished and it makes it the perfect toy for car trips and holidays. Urban Baby sells the boxset trains and other sets for $59. 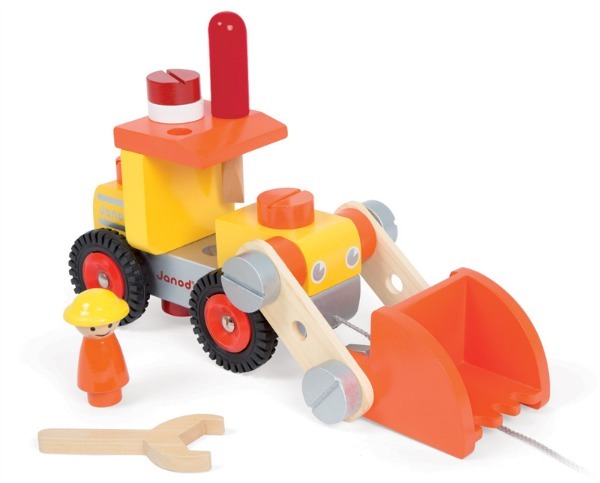 Kids will have hours of fun building and then playing with this DIY bulldozer from Janod. This classic wooden toy is styled for today’s children and comes in bright, cheery colours. The chunky bolts and tools are perfectly sized for chubby little hands and encourage young construction enthusiasts to learn fine motor skills and hand-eye coordination. With a range of other award-winning vehicle styles available, this DIY bulldozer will only be the start of your Janod collection. Little Sprout sells it through their online store for $49.95. The Everyday Heroes Wooden Play Set allows future action heroes to start honing their skills. 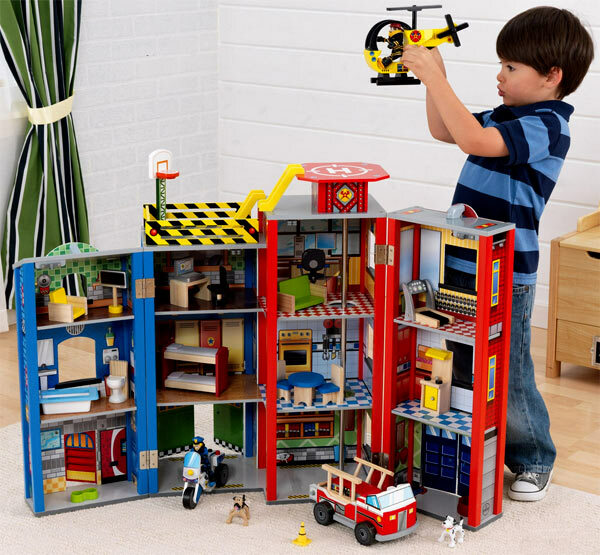 With lots of points of interest including a fire truck, police motorcycle and helicopter, this play set is big enough for multiple children to play on and it folds up for quick and easy storage. Lime Tree Kids is selling this action alternative to a doll house for $299. I love toys that don’t just entertain but truly engage kids on many different levels. 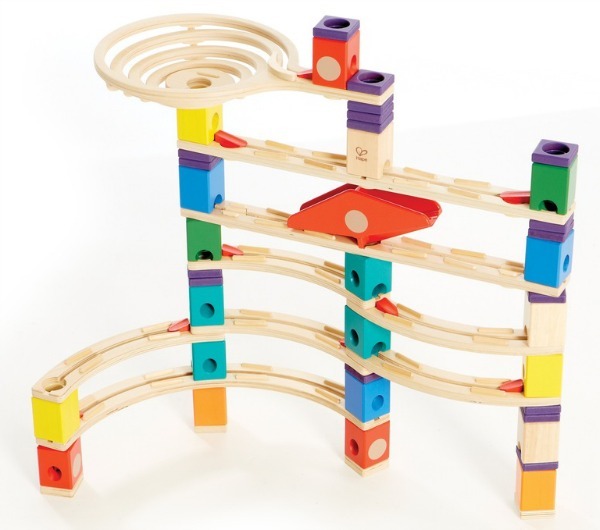 The Quadrilla Xcellerator is a marble run that challenges imagination, encourages problem solving and communication skills and gives fine motor skills a work out. Easy to construct with a versatile design, kids can change and adapt the course as they go along. This toy is fascinating to watch and it definitely won’t be one that the kids grow out of any time soon. Buy the Xcellerator from the Quadrilla Marble Runs online shop for $149.95 and check out the rest of the interchangeable range while you’re there. Fuel a child’s need for adventure with a Little Campers children’s tent from Field Candy. 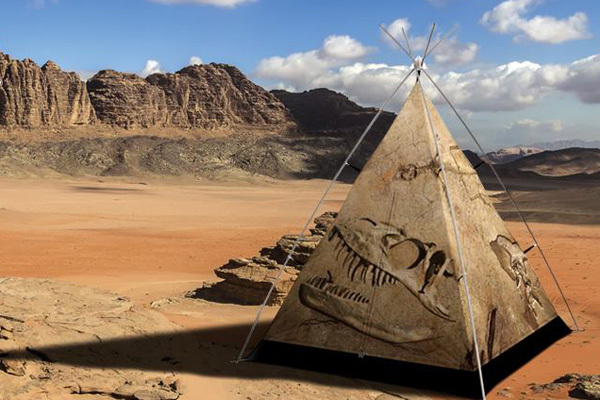 In their signature eye catching designs, the modern teepees come in a range of fun design options including a space ship, dinosaur bones, circus tent or underwater reef. They are durable enough to be left outside all year long or can be put up inside as well. Buy them in Australia exclusively from Lusso Store for $389. Pair your tent with an Explorer Case from French toy company Moulin Roty. 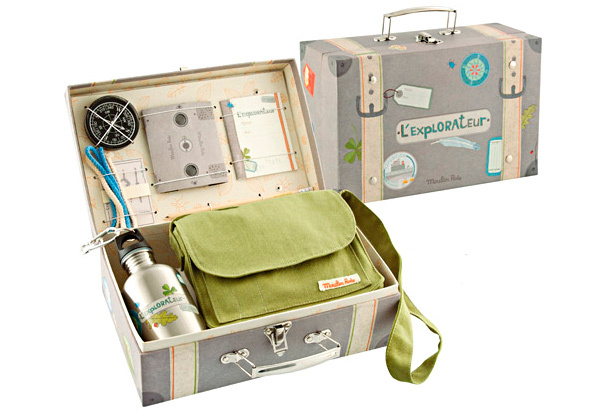 This truly exquisite kit includes a water bottle, compass, mini khaki messenger bag, fold-up binoculars and a piece of string, all packaged inside a sweet sturdy cardboard case. It costs $109.95 from Send A Toy. Keep the body moving with Animal Yoga for Kids. It’s never too early to promote fitness and flexibility and Zoo Yoga from Janod is a fun way to make it happen. A game suited for 5-10 year olds, Zoo Yoga can be played indoors or outdoors and comes with an instruction book as well as 22 different animal cards. Purchase it from Entropy for $39.95. Now that the stereotype of “action toys” has been completely turned on its head, it is time to get down to choosing. We don’t envy you the decision making process but are confident that your active youngster will be kept busy with any of these options.